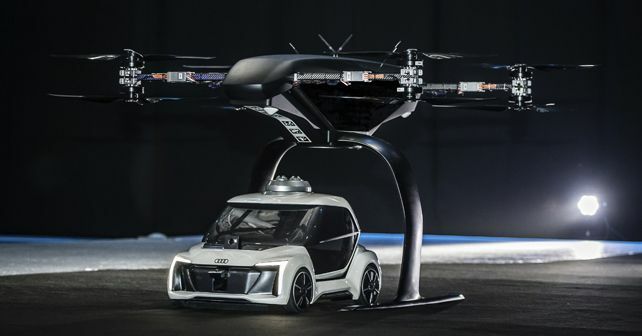 Hailing a flying cab may not be something from a sci-fi movie anymore as Audi, in partnership with the Airbus and Italdesign, managed to successfully complete the first public flight of the Pop.Up Next at the Drone Week in Amsterdam. Touted as ‘the flying taxi’, this concept is a 1:4 scale model and was unveiled at the Geneva Auto Show earlier this year. Now keeping in mind that this is only the first of many test flights, Audi believes that the full-size version for this urban mobility option will arrive within this decade or so. The German luxury car manufacturer is confident that this ‘flying taxi’ will be a convenient and efficient flying service in big cities, both in the air and on road. The Pop.Up consists of three different components - a chassis with wheels, a two-seat capsule for passengers and a four-rotor drone. The prototype is based on an autonomous electric car with a passenger pod. As it’s a self-driven car, it can drive and park itself under a drone frame, which then receives the passenger capsule, transforming it into a passenger drone. During the maiden flight test, the prototype flew across the hall and then meticulously landed on the designated parking area where the electric car drove by itself underneath the drone. Then the passenger pod of the car latched itself onto the drone and flew away. Audi is further conducting tests in South America in cooperation with the Airbus subsidiary Voom to see what an on-demand service of this kind could be like. Customers can book helicopter flights in Mexico City or Sao Paulo, and an Audi car is made available to ensure that their journey is completed or ferry them from the landing site. Apart from this, Audi is also supporting the Urban Air Mobility flying taxi project in Ingolstadt. This initiative is preparing test operations for a flying taxi at Audi’s site and is part of a joint project of the European Union in the framework of the marketplace for the European Innovation Partnership on Smart Cities and Communities. This project aims to let the public know the benefits of the new technology and clarify concerns related to battery technology, regulation, certification, and infrastructure.